Today begins with the lovely trine aspect from assertive Mars to dreamy Neptune we experienced yesterday. This aspect may make us feel light, inspired and dreaming of what to bring into the world for coming year. Today is a great day to sit down and think about what you dreamt of in January of 2017? Did you achieve it or it came true? If it turned out to be an unrealistic fantasy, this is a great time to begin the process of letting go and releasing it. If it is a dream that you still want to come true or you are very keen to continue to pursue it, than pay close attention to whatever impressions and images you are getting as this Mars and Neptune placement is bringing their special powers forth at this time as their gifts to us to incorporate into our live to help us reach our dreams. Today get creative!!!! Its time to engage in creative endeavors and hobbies, especially anything dreamy and artistic such as music, journaling, movies, film, cooking and story telling. It’s also a time to focus and push yourself forward, to dream big for 2018, and to see your dreams flourish over the coming year. Raise your vibration, count your blessings and remember we create our own destiny, so put forth all the goodness and healing you want to achieve next year! The Moon leaves Aries and enters Taurus early this morning. When the Moon is in Taurus for the most part, we express our need for comfort, leisure and predictability. This is a No Rush day, however we can find it easy to over do it with comfort food and slip into a lazy trap. So watch out if you are trying to shape up for the New Year. The Moon in Taurus has a very sensible and grounded energy, as well as a slow, steady and very sensual vibe. The abundant Taurus Moon adds value into your Mars/Neptune planning for 2018, so if your intention is to increase your abundance and cash flow, work with this energy. If you have the time to work on your visualizations and affirmations do so! The Moon is in adventurous, expansive Sagittarius all day. What a great energy to open up to the world, plan a trip and hang out with friends. When the Moon is in Sagittarius we take a philosophical attitude and approach to problems or challenges in our lives. Mundane and emotionally draining activities and routine bore Sagittarius so get out and get active and experience a change in scenery will help restless energies today. This position of the Moon also encourages us to get out be spontaneous,is there a new way of thinking that calls your name? Search it out. Form a spirited approach to the world with a philosophical understanding. This is a time for the energy to be easing up a little, as the Moon spends the day in dreamy Pisces and aligns with Pisces’ modern ruler, Neptune, which is stationing retrograde today. Neptune is the planet of dreams and inspiration, it is a water planet. It is represented as King Neptune in mythology the ruler of the seas and is related to the high priestess in the tarot. So with all this water energy , Neptune rules our dreams, emotions, intuition and in particularity our ability to manifest . We will have access to all the universal knowledge and being in touch with your collective unconscious. We are passive and ready to receive those message, gut feels and that wisdom of the universe. When Neptune stations retrograde the energy seems to go backwards, which means it is even more passive. What happens is that you become more intuitive, you become in tune with your own self and the spiritual and creative guidance you receive will increase. You will have the capability to hear the messages meant for you from the universe loud and clear , heightened insights , heightened receptivity and guidance for the next coming 5 months,until November 22nd pretty awesome hay! The rest of the year really tune in , listen to the guidance that is being given to you, dreams, repetitive thoughts, feelings, ideas, this is the key to getting the best out of 2017! Over the next 5 months we see a rise in personal creativity and output. let the creative juices flow and inspiration energy is high, so pay attention all you writers, artist and healers. Those who work with the spiritual realm, if you feel that you are one that can channel spiritual information do so! Especially when it comes to putting into your work, projects and art. However, Neptune governs the veils but he also governs the mists of confusion.The retrograde cycle can be a time of indecision or feeling in limbo, but it can also be a period of inner discovery. This can also be a period of time a sensitive and perhaps confusing one. The Moon moves into Pisces today! We see the Moon go from the lovely air sign of Aquarius into a water sign of Pisces, which means there is a shift from mental thoughts to emotional depth! The Moon also conjuncts Neptune in Pisces,(Ah the water planet in a water sign ) and quincunx Jupiter and Mercury in Libra . The ability to articulate and communicate is very good again today with Mercury / Jupiter in Libra, but with Pisces energy very high today so are our emotions! We are very intuitive and very creative. Today is great day to articulate your hopes and dreams and talk to others about how you are feeling about the future and what you would like to happen. Today is a day that we are feeling highly inspired, we can write a short story or a poem due to our ability to tap into our emotional side! We are able to delve deep into our emotions and sub conscious, and if you usually feel awkward or uneasy about tapping in and expressing your emotional side, today is the day you will comfortable doing it! Mercury in Libra quincunxes Neptune in Pisces which is great for creativity and dreams but it can blur the reality between truth and reality and fantasy, as Neptune is the planet that rules illusions, intuition and psychic energy and can make it easy for us to see what we want to see , ignore the truth and listen to the voice (ego) within and believe our own lies. Today some of us may have the tendency to daydream and possibly at the expense of our productivity and clear communication. Lets just say it’s not the best day for us to see matters clearly. There is a quincunx between Venus and Uranus early today.Venus wants connection and intimacy were as Uranus wants freedom and to rebel . This can mean some will have difficulties in decisions regarding love and money.Some may face a challenge whether they are ready to get close to someone or are you willing to maintain certain relationships that you feel are stuck! Some may feel they are loosing their independence and want to cut ties! Venus / Uranus aspect can bring disruptive energies into relationships but on the brighter side it can also bring things to Light that may need healing or clearing out, ready to fully letting go. Write your wishes and/or intentions down – either on a sheet of paper with a pen, or with coloured pens, pencils and so on. The more energy you invest, the better your results are likely to be. Read them out to the Universe then either bury or burn your list, or set it aside so you can check it this time next month, to see how your wishes worked out. THIS IS THE CRUCIAL BIT: Really, really, FEEL how you would/will feel if and when the wishes come true. Hold those feelings. The veils will continue to thin even further this week and multidimensional reality brought forth. During this phase you will have the subconscious brought to the conscious through your dream and meditative state. Be sure to journal any and all as this will provide “keys” or “glimpse” to your immediate future. How exciting..
Don’t forget to open up and look for synchronicities, this is a very exciting week so expect more abundance in your life and blessings to come your way out of the blue! Today’s Angel Oracle card is.. This card is a signal that your energy and attention need to be grounded. If you’ve been feeling spacey, confused, or forgetful ( who can blame one, with all this crazy New Moon, solar eclipse energy buzzing around) this card speaks to the reason. “Ungroundedness” means that your attention is directed up too high, as if you’re not in your body. A balance is needed between a focus on spirit and a focus on Earth. You can ground yourself by walking barefoot on grass or soil, by eating foods from the ground like potatoes or carrots, by rubbing your bare feet, by touching a tree or plant, or by visualizing roots coming from the bottom of your feet into the earth. 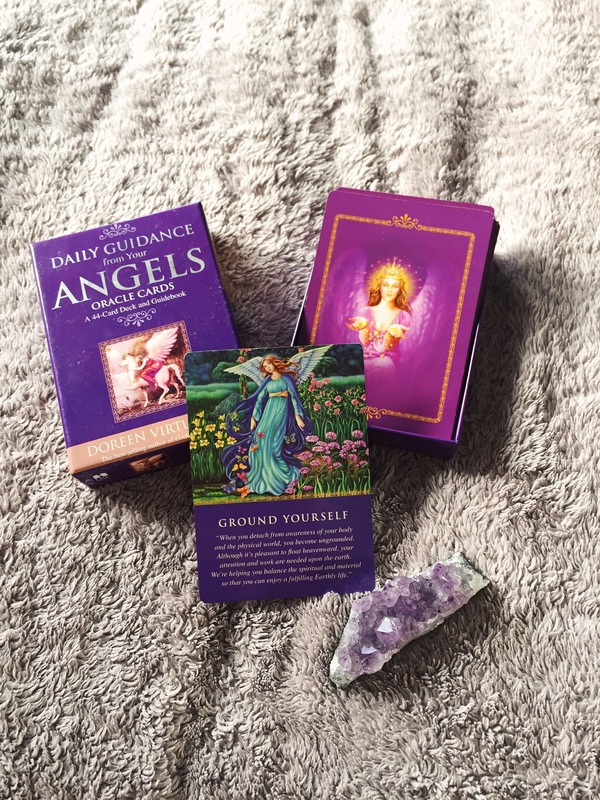 Grounding will help you to better concentrate and focus, and will also increase your connections to the angels. Send love and light to Mother Earth. This New Super Moon in Pisces has and will create confusion, and mixed energies in many sectors of your world. This strong new moon solar energy brings with it strong opinions, creative ideas, lots of day dreaming, emotional healing and mystical events, it is important during this time that yes we can float away with out imagination and get lost in dreams but we must still stay grounded. There are two powerful ways to get grounded. One way is to do a tree meditation. First, stand up, or sit up straight and tall. Make believe that you are a tree or visualize that you have branches that extend out of your body way up into the sky as high as you can imagine. Next, imagine that you have roots wrapped around your legs that are buried deep, deep within the core of the earth, wrapping around your ankles cementing and anchoring you deep. Another way to feel grounded instantly is to hold a large, smooth rock in both hands or crystals with grounding energy and vibrations. You are now grounded and energetically connected to the earth and the Universe.